This first novel by MacPhail, now published in paperback, deals with a social issue, bullying in this instance, embedded in a thriller. Katie is the only child of loving, comfortably off, parents, but this perfect life is marred by bullies. Attacked on her way home from school, Katie's tormentors are seen off by a nameless girl Katie comes to call 'Zan' after the box in which her rescuer lives. Zan, on the run from circumstances which are revealed at the end of the book, hides out in derelict buildings and waste ground. She knows how to take care of herself, and empowers Katie to do likewise. MacPhail's bullies are unattractive characters and Run Zan Run is very much onside with the bullied. When Katie's teachers discuss bullying in terms of problems which might have led the bullies to behave as they do, Katie is emphatic that this is an attitude behind which bullies may hide and carry on their terrorising of those weaker or more defenceless than themselves. She also raises the question of bullying behaviour, which when stamped out in school, is merely relocated to other sites such as Katie's route home from school. Important issues are raised in Run Zan Run and its thriller framework makes it a book which will be read for its action centred plot rather than any social messages contained within it. This is laudable, but all the more pity then that a rather overly melodramatic conclusion may strain a reader's suspension of disbelief. 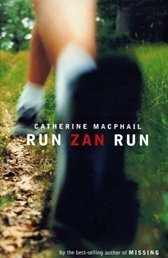 Originally published in 1994 MacPhail has since then written books which, to a greater extent, foreground her ability to develop character and portray domestic situations.